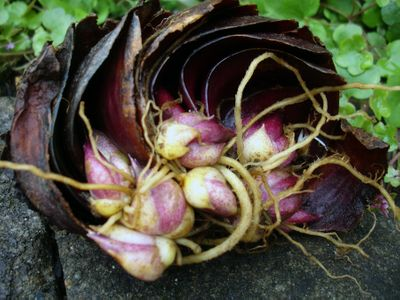 Here's how SCALING works: A Lily bulb is comprised of tightly overlapping scales (food store-houses) which look very similar to a fresh artichoke in appearance and which store all the genetic data for "cloning", or growing, another identical bulb of, for instance, 'Casablanca' or 'Conca d'Or'. Extra scales, not needed to feed the bulb for the current year are removed, incubated in a slightly damp medium to approximately 70 degrees F. for several weeks until pea-sized bulblets form. They are then refrigerated for four to six weeks to simulate winter and then planted into freshly prepared soil in late spring. In late October these bulblets are dug and stored in coolers over winter before being replanted in a permanent field for two to three more years of growth. The photo shows a bulb that was damaged during harvest. Since it was a variety that we needed to increase, and the basal plate (bottom of the bulb was intact),it was kept in the bulb tray with the other good ones. Several weeks later, when it was time to sort and clean, this beauty had already begun to make "scale bulblets". There are 13 bulblets showing at the time of the photo, but others could also be forming just under them in a couple of weeks. Because things are progressing so nicely, the entire bulb unit was simply left alone. In spring, the bulblets will be removed and planted out in a row with the other scale bulblets.